Because all you want to do is press the remote control ! Secure and design ventless fireplaces and electronic ethanol burners . Designer's dream, electronic bio ethanol fireplace and stove, AFIRE without constraint easy to install, easy to use. The new way of building a smart and design fireplace is to install an electronic ethanol burner in your living room. But if you are affraid about works in progress you can install a "ready to use" bioethanol fireplace with remote control. Here is the range: table fireplace LOU, fee standing fireplace ARCH, wall mounted ethanol fireplace SASA, modular and design fireplace LOFT. All these models can be installed within a minute. Rethink the fire and light up your dreams! In 2015 numerous trends show that bio ethanol hearths join the ideas of eco-friendly development and housing improvement. With their ease of installation these contemporary fireplaces are at the same time ecological and simple of use. The fashion house dedicates them more and more space with the custom of remote controlled bio ethanol burner inserts. AFIRE is one of the leader on this trend. The range AFIRE integrates devices of all the lengthes and shapes. The idea being to adapt itself to the design of the room in which bio fireplace is settled. It is not any more the hearth which dictates the design, this one adapts itself to the universe of the created fire. As all the modern objects, bio-fire are easy to use. No more duties to supply its fireplace with logs, it is simply enough to fill the reservoir of bio-alcohol and to press on a button to start flames. Moreover, the use of wooden fireplaces is unfortunately more and more restricted by the various rules and regulations in the urbanized zones. The ecological fireplaces thus see their numbers in constant increase. It should be noted that many products are simple bio alcohol tinswhich are dangerous to fill, to switch on and off. The contemporary automatic bio ethanol burner insert AFIRE is endowed with numerous electronic safeties which allow to command and to use these modern devices in a safe way. The answer which immediately occurs it is that it is not useful to install an exhaust duct. The alcohol by burning does not produce nuisances. We can thus set up simply all types of bio - inserts without heavy works of installation. The offered perspectives are unlimited both for the conditions of installation and for the Design. Secondly the assembly is also very simple. It is necessary to create a fire space with its own decoration and to embed the insert of its choice there. Moreover these devices do not require maintenance, a soft rag allows to clean the high stainless steel plates. AFIRE rethink the fire and light up your dreams! Explore possibilities of the ethanol fireplace world with two main ranges of products: embeddable burners and hearths ready to install. Solutions which allow to restore the fire life into an urban and sophisticated frame where the constraints for the user are banished. The Designer of these new spaces becomes the center and the artist of your well-being. We can conceive all decorations with these new fire-objects. They fit into all the projects of home improvments. The electronic ethanol hearth is a modern world tool. It is secured and remotely controlled. 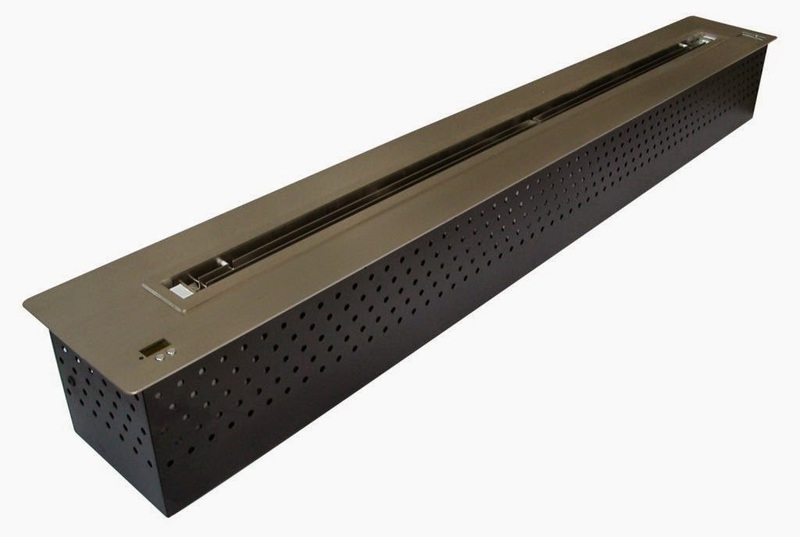 It offers the advantage to do not require an exhaust duct and thus to be installed in a few moments. No more duties, no more smells,no more cleaning, the bioethanol is a modern and ecological natural fuel (it is a part of renewable and eco-friendly energies) which does not produce smokes. Vent-free fireplaces and inserts can be settle down everywhere. This adaptability allows the creators, the interior designers to be released from the installation constraints. They can thus create their projects with a design heath quite freely. The modern fire can be used in all the culture Designs decorations simply by embeding a remote controlled automatic bio ethanol burner insert. In front of a globalized environment the desire of cocooning becomes widespread. The interior decoration becomes more and more important, not to to turn in own ourselves but to open a window on the world in complete safety and serenity. Provide a modern well-being becomes the essential mission of the architects and designers. The fire offers the advantage to get a soft heat but also to invite to reflection and dream. With the new AFIRE concept, the professionals can create an urban fireplace following their decorating ideas. The fire-space is not any more a piece of furniture with a defined style but a modular tool which joins in a created design following the desire of the users by professionals attentive to the modern tools which they own. AFIRE created the buzz with a new fire-tool for designers. The range MODULO allows to design all forms and all dimensions ribbons of fire. Totally modular these bio ethanol burner inserts fit between two terminal parts. One of this part, the Master, pilots all the modules and the safety. A line which allows to build hearths of very big lengths with the possibility of inserting angular modules to create totally new forms. It is possible to insert up to ten modules between the Master and the finishing Modulo. A single data cable is necessary for the connection between the Master and the internal modules. It is also necessary to to supply power to all modules with the adapter 12/100-240 volts supplied. Electrically managed, Modulo switch off automatically in case of abnormality. Safety sensors allow to detect a too important temperature, a polluted air (CO ² sensor), a bad locking of the tank door, etc. The safety is essential with these big inserts. The piloting of this elements is made with a single button: on the remote control, on the top plate of the Master or through the dry contact (no potential relay). These features allow to command any home automation, Wi-Fi transmitter, Smartphone, etc. Find out more information on the page: Modulo remote controlled automatic modular fire lines (web site: www.a-fireplace.com). Modulo fits in any support very simply. It is enough to foresee a cut out and insert one by one the modules which are going to create a continuous fire line. Obviously the over surrounding parts of the ethanol burner insert must be made with incombustible materials if flames can touch them. This range was created to answer to the designers and builders requests. Modulo is designed to fit in large spaces, commercial premises, XL rooms where it is possible to create large fire points (Modulo doesn’t suit to standard rooms or lounges, in this case prefer the BL or BX compact inserts lines). The variety of forms and lengths, by segments of 25 cm - 9,84 inches (50 cm -19,69 inches for angle modules) allows to realize extraordinary fireplaces designs. Find out more designs and installation examples on the page: Modulo Fire Ribbons, electronic modular inserts (website: www.a-fire.com). With AFIRE design rethink the fire! 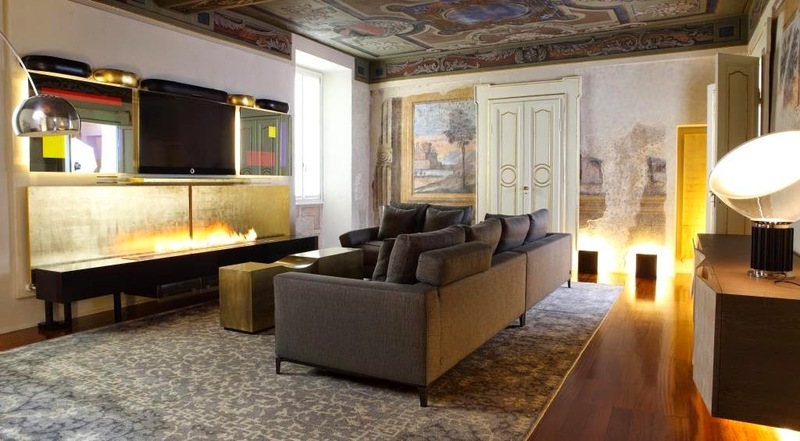 Now it is possible to install your contemporary ventless fireplace with an AFIRE automatic bio ethanol burner insert endowed with electronics and remote control. 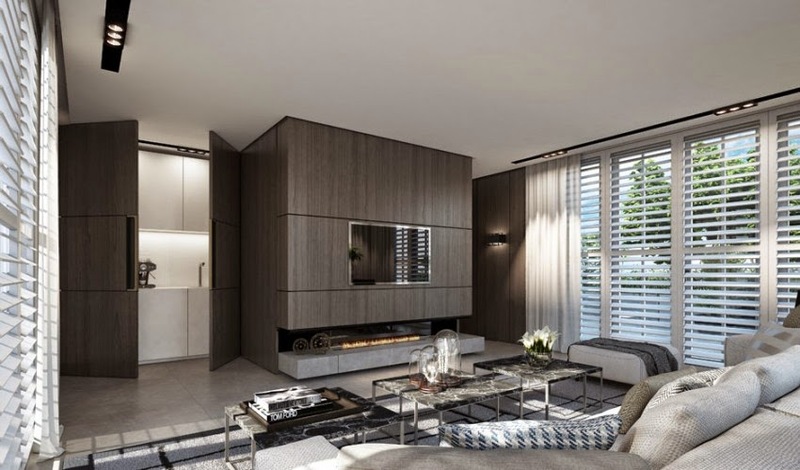 You don't need a flue or a chimney to settle these new inserts that can fit easily and quickly any kind of living room or commercial premises. Electronic and remote controlled these bioethanol hearths arise from a new concept: use the fire in a constraint-free way. a FIRE without installation, easy to use. If we want to be able to use a ventless fireplace in a flat or a house located in urban areas, it is absolutely necessary to choose automatic safeties which stop the device in case of the detection of an abnormal operation or an environment issue. It is also important to be careful during the ignition of your device and do not approach the hands close the flame. Lastly the completion of the tank can present risks with manual devices which are not endowed neither with automatic trap door, nor with heat sensors. For several years AFIRE conceives secure vent-free inserts equipped with electronic detectors. These sensors shut down flames in case of danger and prevent the opening of the trap door if the device is too hot. Moreover a simple press on the device button or on the remote control switch on or off the bioethanol hearth. High technology doesn't mean complicated device. This is the opposite with the AFIRE's products. Fill up the tank and press the remote control with some 95-97 % bio-alcohol, that's it. These simple gestures allow to spend a wonderful evening front your constraint-free automatic fire. No more traditional duties! A modern device must absolutely be simple for a daily use even if its conception recovers from an advanced high technology. These bio inserts allow you to promote a better design rather than the constraints of installation. Designers, builders can freely embed these fireplaces into new houses or for home improvement. Just need to insert the device in the chosen decoration. That's it! Rethink the fire! Introducing the new ecological electronic ethanol burner remote controlled.